I first got the idea to make this inexpensive Halloween decoration thanks to the all-might Pinterest. I pinned this idea a few months ago, and during one of my many trips to the Dollar Store I found Severed Hands. That’s when it occurred to me that I could plant this bad boys and make my own sort of “zombie planted hands”. Depending on how many Zombie Planted Hands you “plant” will depend on the cost of matierals. In my case I needed 6 hands (although 5 were only pictured at the time). That automatically brought my total up to $6 plus $1 for potting soil. I had the rest of the tools on hand. 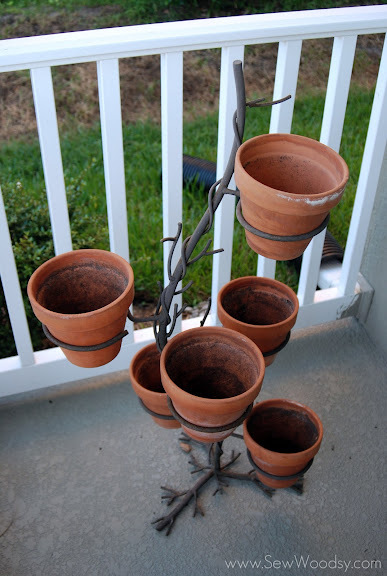 I hope you’ll enjoy my very easy and inexpensive project and recreate your own! 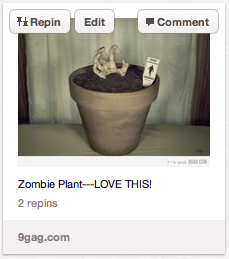 First, figure out where you would like to plant your “zombie” severed hands. I chose to plant mine in the empty pots on our front porch. Next, gather your severed hands. Fill the pots with dirt. I chose to fill my pots with fresh soil that way after Halloween I can just pull the severed hands out of the pots and plant fresh fall flowers (I live in the south–I can do this)! Next, if needed add small skewer sticks to the severed hands. This will help you be able to position the hands into the pots. If you don’t have skewers you can always burry the hands in the dirt. Plant your first severed hand. Don’t be afraid to position the hands at different angles. I love the creepy cool look. Do you think you will plant some “zombie” hands? This is a perfect project for them. Plus they can do it and it’s not going to break the bank! Thanks for the invite. I’ll go link up now! Love these! I’m working on my Halloween porch decor. These are great – very scary! Thanks… yes I’m still waiting for a neighbor to say something… like they did last year when they freaked out about our ghost! lol. This is too funny. Our best friends would love this! That’s pretty gross, but I love the idea! Haha! This is awesome! My kids would love it! We were just at the Dollar Store the other day and they were wanting to buy severed hands. I said no but now I want to go back and get some! You should and surprise them with this project!!! Did you ever think you would publish the sentence “Next, gather your severed hands…”? Love it! These are very creepy cool! The kids and I might have to try this one. Thanks for sharing!! 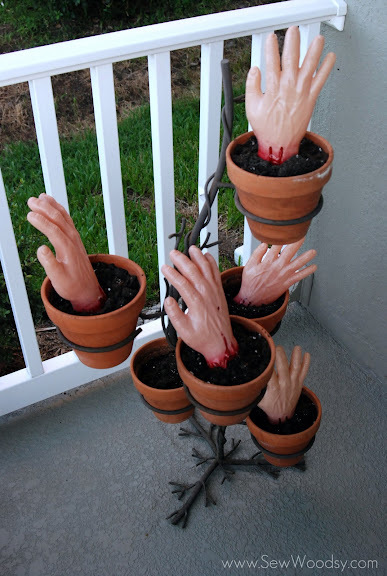 I love this idea and totally going to stick zombie hands in my front planters! so so awesome! I’m going to feature this in my TT roundup. Thanks so much for linking!!! Thanks Stephanie–they are so easy to make!! How did you make the stand that holds the pots and what materials were used?theres never any mention of it? Hi Nancy, we didn’t make the stand. A friend gave us the stand! Sorry!